Nitric Oxide (NO) is a gas previously regarded as an environmental pollutant. The gas is formed by combustion and is present in high concentrations in, among other things, cigarette smoke and car exhaust fumes. It was, therefore, quite sensational when it became apparent that NO is also generated in the human body. In 1998, the Nobel Prize for medicine went to three American researchers for this discovery. They were able to show that NO is important in the regulation of the tone of the blood vessels. A continuous generation of NO takes place in the walls of the blood vessels and this tiny gas molecule dilates the blood vessels, facilitating the flow of blood. Recent studies have also shown that NO is involved in the function of the nervous system, and is able to kill bacteria and viruses. Our research group at the Karolinska Institute in Stockholm has studied the significance of NO in the respiratory system. We have shown that a lot of NO is normally formed in the sinuses of humans. It is worth mentioning that, in many people, the concentration of NO in the sinuses exceeds the safety limit established by the authorities. The sinuses are in contact with the nostrils via small openings and this means that the level of NO in the air of the nose is relatively high. What is the significance of this? On inhalation, NO follows the air into the lungs, that is, when breathing through the nose. As NO is a blood-vessel dilator, the blood vessels coming in contact with the pulmonary vesicles (alveoli) are expanded. This means that a greater amount of the blood that passes through the vesicles can be oxidised. Studies have shown that humming, singing, mantra chanting and especially the breathing exercise Bhramari Pranayama, (the Bumble Bee) increase the production of Nitric Oxide (NO) in the sinuses, and gives a healing effect. (Comments by the editor). We compared breathing through the nose with breathing through the mouth to see if it was possible to show whether there was a difference in the oxidation of the blood. Quite rightly, it revealed that breathing through the nose led to a 10 – 15% higher oxidation of the blood. As a verification, breathing through the mouth with added NO from a gas bottle gave a similar effect, which corroborates that the NO in the nasal air has a positive effect. We have also looked at the importance of the nasal air for patients lying in a respirator. These patients are intubated, that is to say, they have a tube from the respirator directly into the respiratory passage. This means that their nasal air is never part of the breathing. We connected a simple pump system, which sucked nasal air from one of the nostrils, and this air was given as a supplement in the respirator. This relatively simple procedure increased the patient’s oxidation of the blood by 10 – 20 %. These findings demonstrate a new principle where an effective substance from the body itself, NO, is generated in the sinuses and carried with the inhaling air to produce an effect in another part of the body, the lungs. In this way, NO works as an airborne mediator in the human respiratory passages. If one looks at the animal kingdom, then only monkeys and possibly elephants have NO in their nose. The other species seem to be lacking this system. One might imagine that monkeys and humans require this system to optimise oxidation because we have risen up from walking on all fours. The knowledge that it can be advantage­ous to breathe through the nose is widely known, but there has been no scientific explanation for why it should be good. It is obvious that the air is cleansed more effectively when breathing through the nose, but that does not explain the positive effects of oxidation. On maternity wards, the expectant mothers are encouraged to breathe in through the nose and out through the mouth during contractions. Physiotherapists often point out that patients with respiratory problems should breath in through the nose and out through the mouth. Certain elite athletes use nasal expanding plasters. 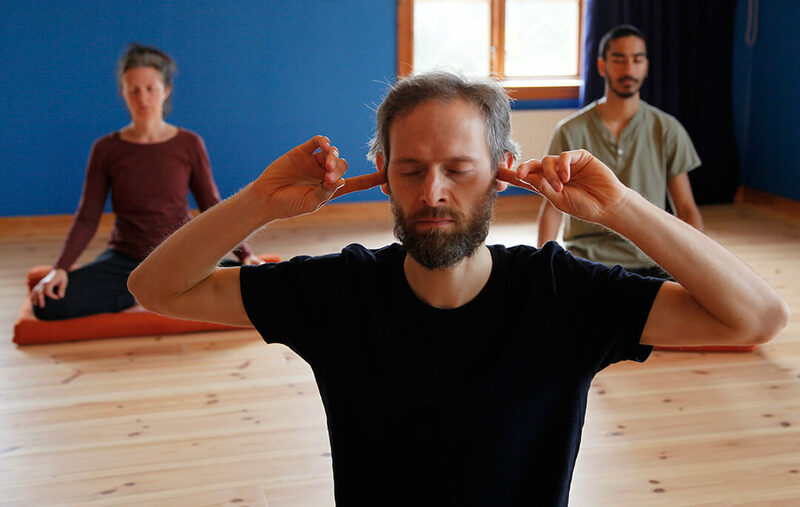 Within Yoga, there are a wide variety of techniques for nasal breathing. Even in the Bible, a reference is found that can be interpreted as that nasal breathing can be important: “ And the Lord God formed man of the dust of the ground, and breathed into his nostrils the breath of life; and man became a living soul” [Gen. 2:7]. Consequently, there is a many-thousand-year-old knowledge of the importance of the nose for breathing. The current research into this tiny gas molecule NO may have contributed with a scientific explanation. A colleague of the author of the above article, has been a student of our school in Stockholm for many years. He has had asthma since childhood. When he learnt the first step of Nadi Shodana, where one breathes slowly through alternate nostrils, but without holding the breath, it caused him great difficulty. He nevertheless continued and went on to the next step where one holds the breath after each inhalation. He allowed the air to gently press up in the nose against the sinus and frontal sinus. It was then very easy to do the exercise and it helped his asthma immediately. Now, he is almost free from his medicine. 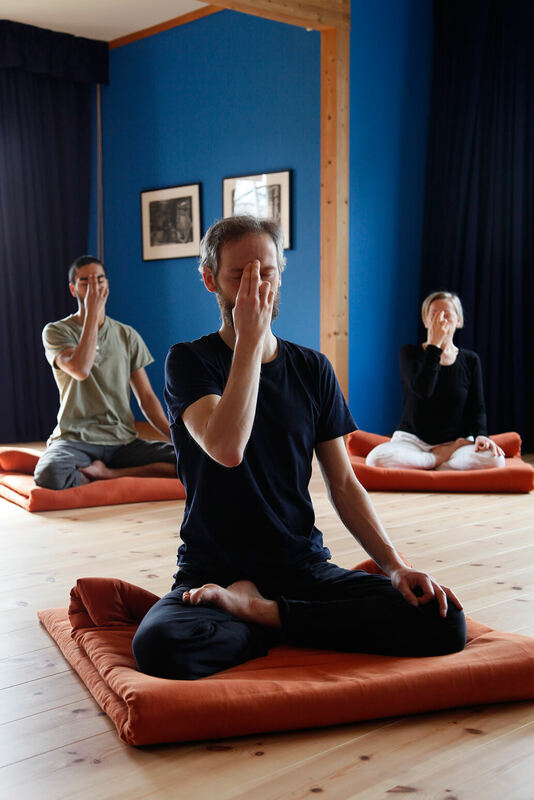 He emphasises the importance of closing the nose with the fingers and holding the breath so that the air creates a slight pressure upward in the nose. This raises the air supply to the sinuses, where Nitric Oxide is generated. In this way, one can benefit from the threefold effect NO has – relaxing and dilating the blood vessels, increasing the oxygen absorption in the lungs, and killing bacteria. He believes that all this is contributing to help him be free from asthma. Is it relevant for the absorption of NO that the nose is clean? Perhaps this is the real reason why nose cleansing (Neti) is such an important part of yoga. If you are inspired by this, then use a pot which is large and with a long spout. This gives a satisfactory effect and encourages one to cleanse the nose regularly.